We’d love your help. 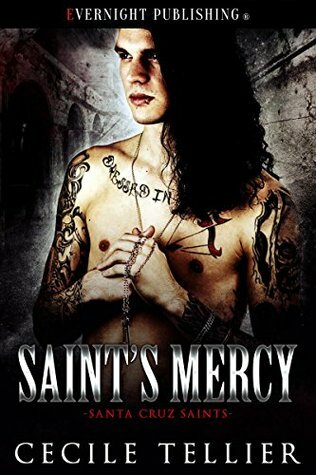 Let us know what’s wrong with this preview of Saint's Mercy by Cecile Tellier. Lucien Rossi grew up on the streets of Santa Cruz, California. He had little to nothing to call his own, and ran with a rough crowd. He only had two things he cherished in his life, the most important was Luz Ramirez. When he met her he knew she was someone he would die to protect. Years later and now a president of the Saint’s Mercy Motorcycle Club, he’s about to find out Lucien Rossi grew up on the streets of Santa Cruz, California. He had little to nothing to call his own, and ran with a rough crowd. He only had two things he cherished in his life, the most important was Luz Ramirez. When he met her he knew she was someone he would die to protect. Years later and now a president of the Saint’s Mercy Motorcycle Club, he’s about to find out that Luz is still a grenade to his best intentions. To ask other readers questions about Saint's Mercy, please sign up. Cecile Tellier holds Masters degrees in Special Education as well as Criminal Justice: Law. She lives in upstate NY with her husband and two children. She got her start in writing as early as high school and has been published in poetry anthologies and freelance erotica . Cecile is part of a wonderfully supportive critique group lovingly referred to as the Round Robbins. Cecile believes that every Cecile Tellier holds Masters degrees in Special Education as well as Criminal Justice: Law. She lives in upstate NY with her husband and two children. She got her start in writing as early as high school and has been published in poetry anthologies and freelance erotica . Cecile is part of a wonderfully supportive critique group lovingly referred to as the Round Robbins. Cecile believes that everything in life that can be accomplished should and has endeavored to live up to this whether it was starting a flat track Roller Derby league or writing the next great romance novel.